Denise, my yoga teacher, inspired us during class with a compelling story of her 91 year old mother whose health is slowly deteriorating. Moved by her story I offered to take photos of herself and her mum at the retirement village. When she is with her mother, you can see the worry, the helplessness and the sadness in her eyes, but despite all the distress I find love, peace and gratefulness when they are in each others arms. 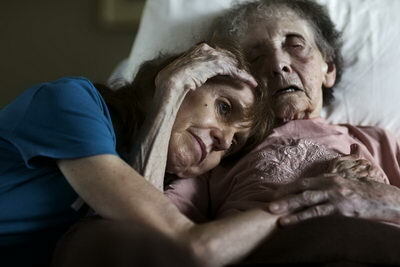 Denise cherishes every moment she spends with her mother; its a GIFT!